When I was growing up, vegetables were three things: plentiful, cheap, and usually canned. So, on the occasional night when my mom could be seen defrosting a tiny square box in the microwave and wringing it’s contents out over the sink, it meant creamed spinach was on the menu and that felt fancy. Despite it’s name, though, the closest my mother’s version came to any kind of dairy was a can of condensed cream of mushroom soup. That’s it. Just those two ingredients. Still, we all happily ate it and will do the same until our dying days. That’s family. I first had a version of jalapeño creamed spinach a few years ago at Brasa, a rotisserie restaurant in Minneapolis that serves Creole-inspired comfort food. Everything I’ve ever eaten at Brasa has been delicious and tends to be the place we hit up for dinner as soon as the weather starts to turns warm and the patio opens. Their variety of braised and pulled meats is small – two chicken options, a pork, and a beef – but they’re done so exquisitely with mouthwatering rubs like garlic and lime. Their sides hold their own, too, and rival the meats for greatness, but if you’re asking me, nothing touches their creamed spinach with jalapeño. It is absurdly good. This is creamed spinach the way it should be made; with milk, cheese, and butter. It’s rich, but the jalapeños cut through the heaviness of it in such a way that I can’t imagine them not being there. That vinegary, spicy bite aside the soft bitterness of the spinach, and the lusciousness of the creamy cheese sauce, is comfort food done right. If you’re looking for traditional, delicate creamed spinach, this is not that recipe. This is the side dish that threatens to outdo the whole meal, dessert included. Preheat your oven to 350°. Defrost the spinach and drain in a collander over a bowl, squeezing it into a tight ball until barely any liquid remains. In a medium-sized pot, melt 1/2 the stick of butter and add the flour, stirring constantly over medium heat until combined, forming a roux. Allow to cook for a solid minute in order to remove the raw flour flavor. Remove the roux from the pan and set aside. Add the olive oil to the pot and follow with the onions and garlic. Sprinkle lightly with salt and pepper. Allow the onions and the garlic to sweat and soften before adding the roux back in and allowing to combine for a minute or so. Next, add the spinach liquid and evaporated milk, slowly, whisking constantly until the mixture becomes smooth and thickens. Add the monterey jack cheese, the black pepper, and celery salt, and allow to combine until the cheese has melted and the sauce is smooth. Once the sauce has thickened, add the diced jalapeños and the spinach. The mixture should, at this point, be the consistency of a thick cheese sauce, like a spinach artichoke dip, and your spoon should follow it around the pot with little resistance. If it seems too thick, add another tablespoon or two of the remaining spinach liquid or evaporated milk. Pour the spinach into a greased baking dish and set aside. In a small bowl, microwave the remaining 4T of butter until melted. Add a dash or two of black pepper, and the garlic powder; combine. Pour in the panko crumbs and the parmesan cheese and toss together, allowing the bread crumbs to absorb the butter mixture. Top the spinach with the bread crumbs and place in the preheated oven for about 20 minutes or until the spinach is hot and the top has browned slightly. Check the dish occasionally to make sure the crumbs are not browning too quickly and if so, cover with foil until the dish is heated through and is slightly bubbly at the edges. 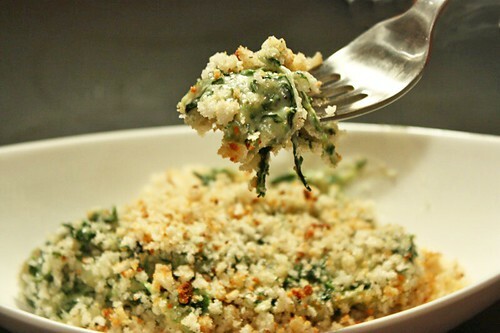 When finished, remove the spinach from the oven and allow to sit for 5 minutes before serving.